* Billet Automatic Shift Knob Our Quality & Finish will leave you with a grin from ear to ear as it is the Best looking unit available for your Ford Mustang and Cobra. 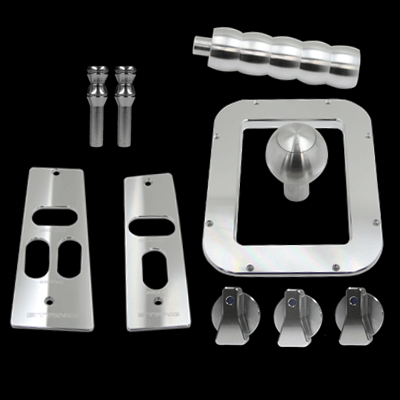 Quality Construction: CNC Machined from 6061 Billet Aluminum for a precise fit and amazing look. Using the latest in Diamond cut technology, which uses a special diamond cutter on the finishing pass giving you the best looking billet part possible. No one gives you the bold clean styling of our Aftermarket Dress Ups, Suspension and Performance Parts for your American Muscle Car like UPR Products! Installs in 30-40 minutes or less. Fits these Vehicles: 1989* 1990 1991 1992 1993 Ford Mustang GT LX 5.0 2.3 V8 4cyl Cobra Saleen and Roush Vehicles. * Mid 1989 Ford changed the AC Knobs to 1.200" (measured across the base of the knob), which is the size of the knobs included in this kit. Early 1989 Mustangs came with 1.600" knobs, so this kit will not fit them. Made in the USA!